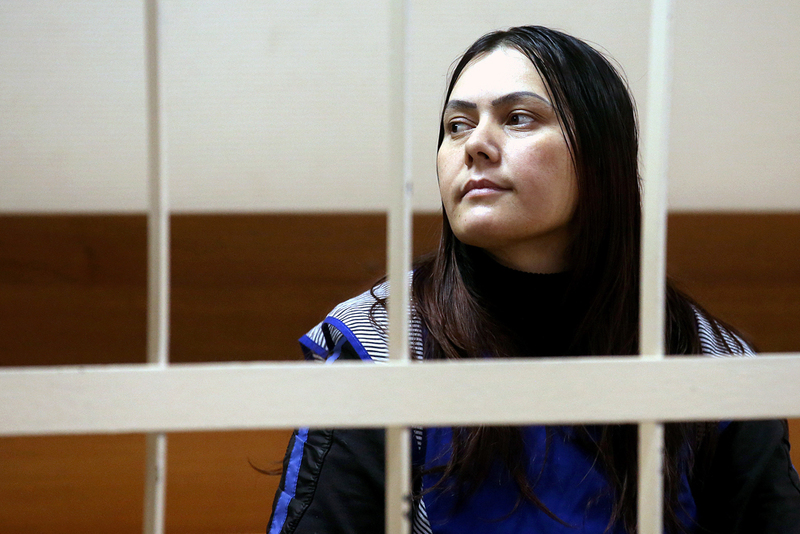 Uzbekistan's citizen, Gulchekhra Bobokulova, suspected of murdering a 4-year-old girl, seen ahead of a hearing into the request of her arrest at Moscow's Presnensky District Court, March 2, 2016. As Russian state TV pointedly avoided coverage of the brutal murder of a four-year-old girl in Moscow by her Uzbek nanny, other media have been putting forward various theories to explain the crime. Meanwhile, some citizens gathered for a small rally outside the Oktyabrskoye Polye metro station, where the girl’s killer was apprehended. A brutal murder in the Russian capital has united Moscow residents in a spontaneous rally, while the silence of state TV channels has forced internet publications and social networks to offer their own theories to explain the incident. The victim, a four-year-old girl who has not been named, was murdered in an apartment on Narodnoye Opolchenie Street in Moscow on Feb. 29 by Gulchekhra Bobokulova, an Uzbek migrant who had been working as the girl's nanny for almost one and a half years. According to police reports, after the parents and the older son left the house in the morning Bobokulova killed the girl, beheaded her and then set the apartment on fire. When the fire was put out the child's body was found. Bobokulova was later detained outside the nearby Oktyabrskoye Polye metro station, where she showed passers-by the severed head while shouting "Allahu Akbar" and threatening to blow herself up. In the three days that have passed since the murder, Russian online media and social networks have produced four theories about the incident: infidelity, drugs, schizophrenia and ISIS recruitment. During interrogation by police, 39-year-old Bobokulova admitted to having murdered the child and said she had done it because her husband had been unfaithful, reported LifeNews on March 1. The police immediately offered the theory of the criminal being intoxicated with drugs. "Experts are not ruling out that the moment the crime was committed Gulchekhra may have been under the influence of drugs," wrote the Komsomolskaya Pravda newspaper. In the coming days Bobokulova may be transferred to the psychiatric department of the Moscow Butyrka prison. Then several state-level mass media sources immediately announced that Gulchekhra has been suffering from schizophrenia for 15 years. On March 2 Russia's largest publication, Moskovsky Komsomolets, published an interview with the head of the village in Uzbekistan where Bobokulova's family lives. "Everyone here knew Gulchekhra. She was strange, putting it mildly. She's been diagnosed with schizophrenia. She's been registered at the psychiatric clinic for a long time, she had the corresponding certificate," said the village head. There is also a popular theory on the internet that the nanny was a follower of radical Islamist ideas, in view of Bobokulova’s behavior prior to being detained by police. The theory of Bobokulova being not insane but an Islamist extremist carried away by jihadist ideas was first put forward by the popular Sputnik i Pogrom internet publication, which published the text on March 1. On March 2 the state RIA Novosti news agency reported that Bobokulova had been recruited to the jihadist cause by her lover, a Tajik citizen. "According to our information, one of Bobokulova had been recruited to the jihadist cause by a Tajik citizen with whom she was romantically involved," said a representative for the RIA Novosti news agency, noting that the case clearly involves planned Islamist recruitment and not a sudden outburst of madness. On the evening of March 1 several dozen people took part in a spontaneous memorial rally by the Oktyabrskoye Polye metro station. The people at the rally discussed why the police had reacted so slowly to the criminal (the woman was not apprehended for almost an hour) and whether the state TV channels did the right thing by not reporting the incident. There were no flags or banners at the assembly and the people did not shout slogans, reported the RBK business daily. In the wake of the murder, the government, concerned about a possible surge in xenophobic feeling, took steps to minimise the risk of potential “reprisals.” A source from the law-enforcement agencies told RBK that on Feb. 29 the police began talks with representatives of ultra-right movements aimed at preventing any action against ethnic minorities. "No one has spoken to me personally, but I’m getting signals," said Vladlen Kralin, leader of the unregistered National Democratic Party (NDP). Earlier, with the help of Tv-news-online.com and channel websites, RBK checked all the news broadcasts aired on the Perviy Kanal, Rossiya-1, NTV, REN TV and TVTS television channels after Bobokulova was detained. Only REN TV reported on the murder and even then only in the morning, after which there were small reminders. The other channels completely ignored the news, limiting the information to text on their sites.